When I discover a strange and unfamiliar fruit or vegetable in the produce section of our local supermarket, I absolutely have to buy it and try it. 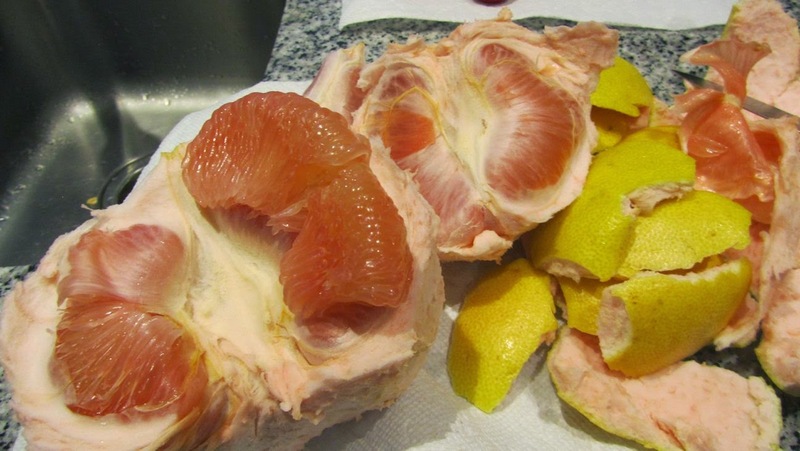 This week it was a Pomelo. 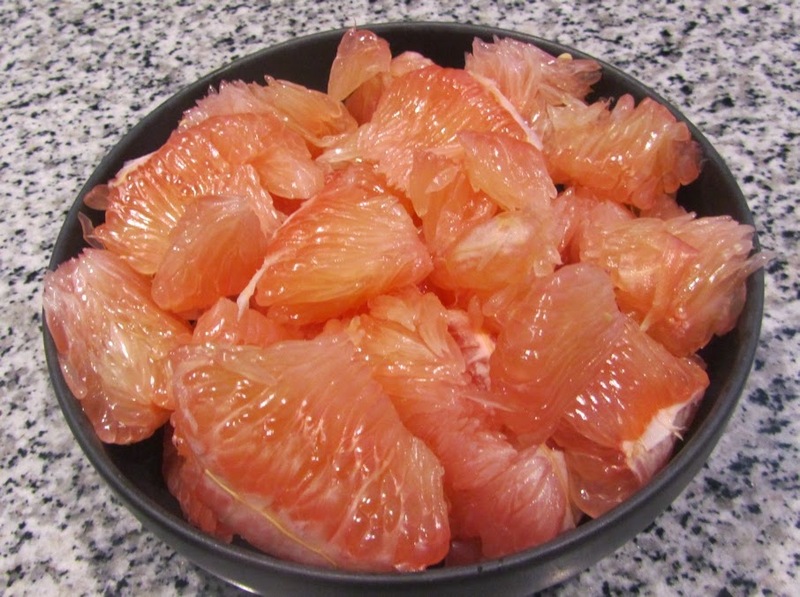 I like grapefruit but I can take them or leave them, and I am somewhat nervous of the fact that they don't always play nice with certain medications. This thing looked like a grapefruit, albeit a very large one, and it did smell like one too, though not so strong. ...the offending compound is called bergamottin, and is concentrated mostly in the skin of the grapefruit, but some is contained in the juice as well (higher levels are found in commercially "pressed" juices than in home squeezed juice). The drug interaction occurs because the bergamottin inhibits an enzyme in the intestines that metabolizes CERTAIN drugs and more drug can enter the body in a person that consumes grapefruit juice. This can result in higher than expected levels of medication in the body. The enzyme inhibition can last a while, so the interaction persists even if the medication is taken several hours after the grapefruit juice. Anyway.. knowing my penchant for strange and unusual produce you won't be surprised to hear that the second I saw this pomelo I absolutely had to have it. It it priced per pound and this little one weighed about a pound and a half - it cost $4.50 and took me quite a while to peel. 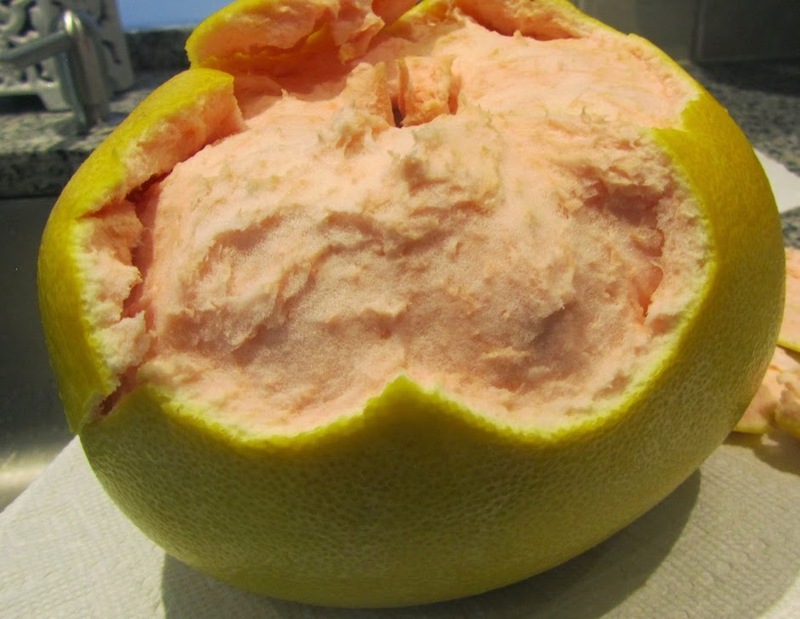 The outer peel was very thick and tough, the inside pith is a beautiful shade of pink and spongy, almost like marshmallow but tougher. The membrane is like leather and has to be removed, but the flesh is made up of large solid 'droplets' removing the membrane is almost like peeling shrimp. 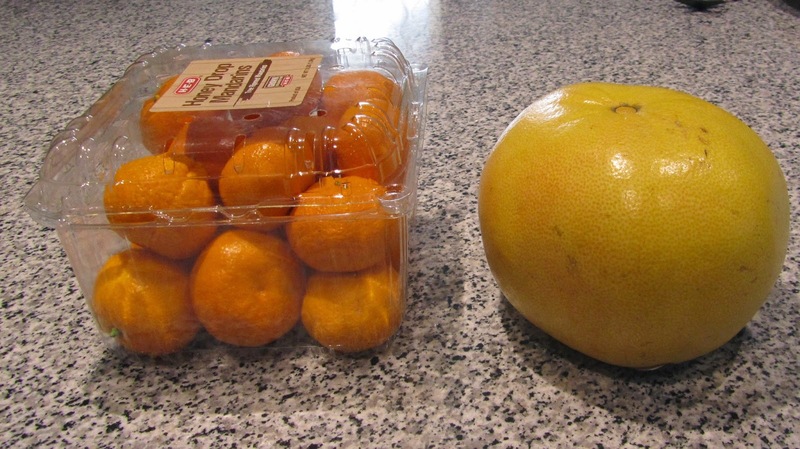 According to wikipedia, this fruit originated in South East Asia, and the grapefruit is a hybrid of the pomelo. When I finally got it peeled, removed the membrane and piled up the flesh into a bowl, I believe I got my money's worth! Plus it tasted amazing. Not a very strong flavor, not bitter but really good and refreshing. My research suggested that it could be crumbled on a salad, and I believe it would be great - almost like a tomato. To find out more about the drug interaction, check on webmd here - and click on the 'side effects' tab. I admit I got bored about three quarters of the way through this, but I guess if you are on blood thinners, cholesterol or blood pressure medication, it is important to know what you are dealing with. I am lucky that I have not yet had to indulge in any of these medication.